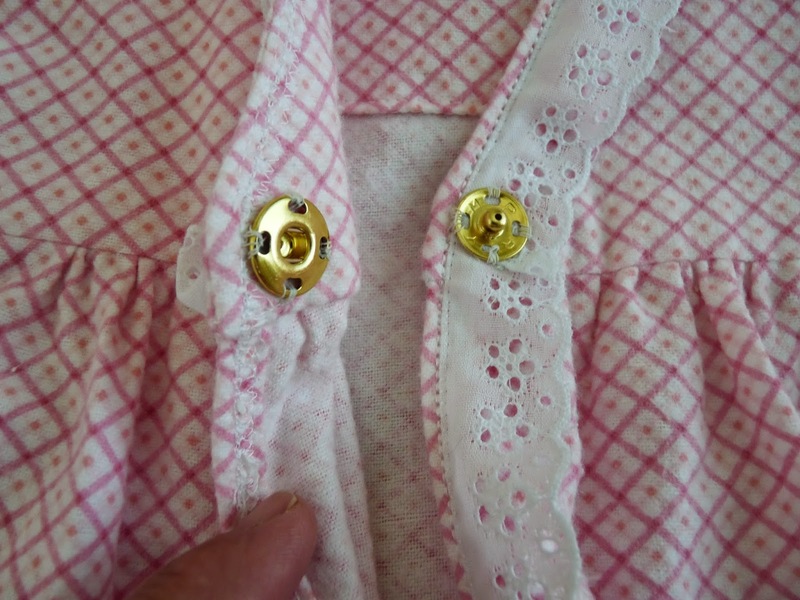 Look at the eyelet tucks in the yoke seam, don't you just want to kick yourself when this happens? But it was easily solved, I just folded the tuck down and sewed the snap over it. These snaps are huge, and bright, but it is all that was available at Joann's. The white snaps were just too tiny, and I didn't care for the ribbon option. With the robe snapped shut, you can't even see the tuck underneath. Not the best solution, but it will serve. The completed robe! She hasn't seen it yet, so I hope she likes it. Well, it is pink, so by definition she will like it. 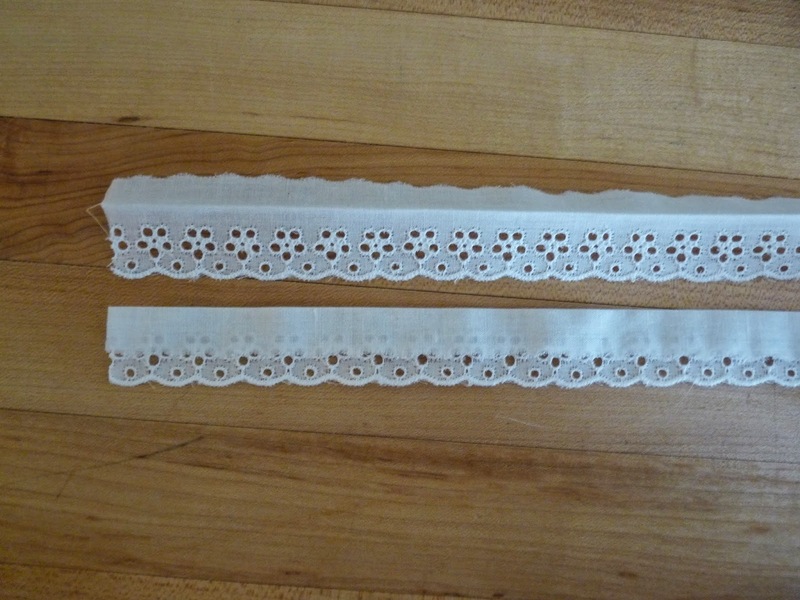 I had just enough lace for the sleeves, nice little bonus. This pattern is easy to sew, and would be quick if I weren't so fussy. Instead of pressing the seams open, I pressed them to one side, triple zig zagged them, and trimmed. 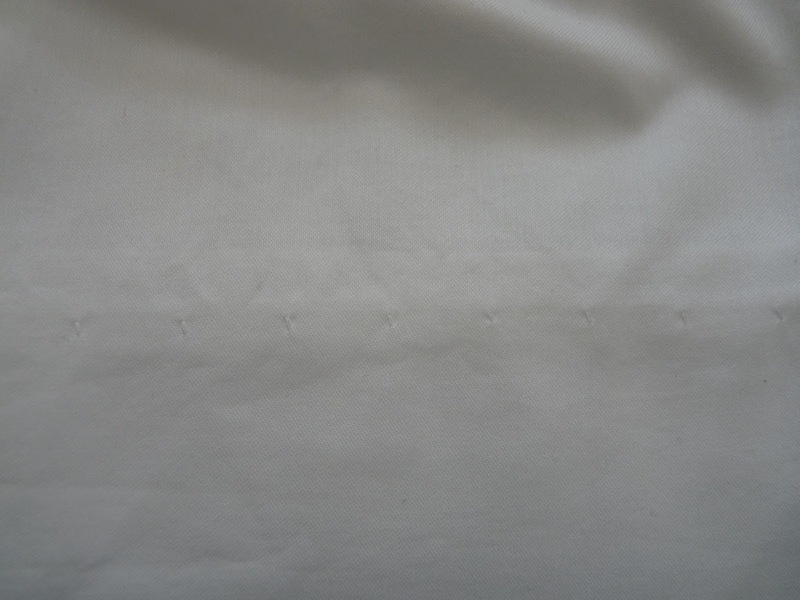 Then I topstitched the seams down. This looks so much more professional that the open seams in the instructions. I don't know why the patterns always call for seams that are pressed open. They look so sloppy. Also, that pin stitching on the eyelet took quite a while. I had to stop and rest my eyes several times from looking at that needle! I don't know if this is the fault of the pattern or the fabric, but I was short a few inches. I purchased the correct amount for size 8, 3 yards, and washed and dried the fabric on hot to maximize any possible shrinkage. Since I didn't measure before and after, I don't know if the shortage is caused from the pattern or the fabric shrinking. I called my daughter and asked for my granddaughter's height, and it turned out that she is 3 inches (7.6 cm) shorter than the assumed height for size 8. So I was able to shorten the body of the robe and had plenty of fabric. I made a note on the envelope for next time, as I will probably make a summer version. All together this took about 16 hours to make. If I were to make it strictly according to the instructions, I could probably shave off two or three hours. The best thing is that she now has a lovely robe that is impossible to buy in a store. I managed to get a picture of her in it, it's a bit blurry but it is difficult to get a seven year old to pose properly. This afternoon I am flying to California to be with Mr. California Stitching for a couple of weeks, so posts may be sketchy for a while. Also, I seemed to have scratched my right eye, so not much embroidery until it heals. 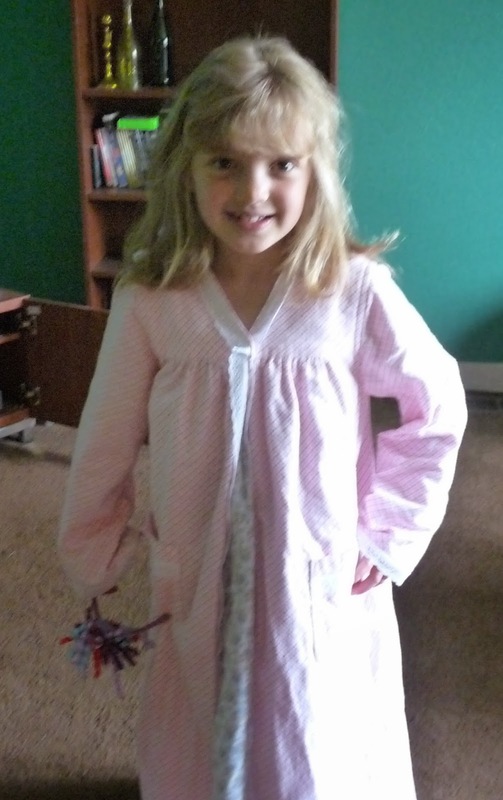 My granddaughter was so happy with her smocked nightgown that not only does she wear it practically every night, she asked for a robe to go with it. I chose Simplicity 1569, for several reasons. First of all, it is not a traditional wrap style robe, which I don't like at all. It is a pretty simple pattern, with no collar and only a simple tie at the front. 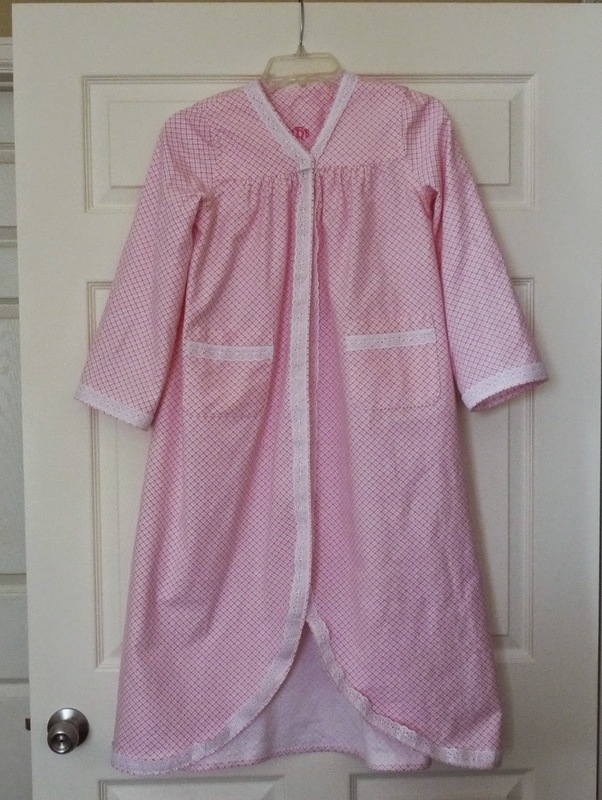 And it has a nice PJ/Nightgown option which I really like. 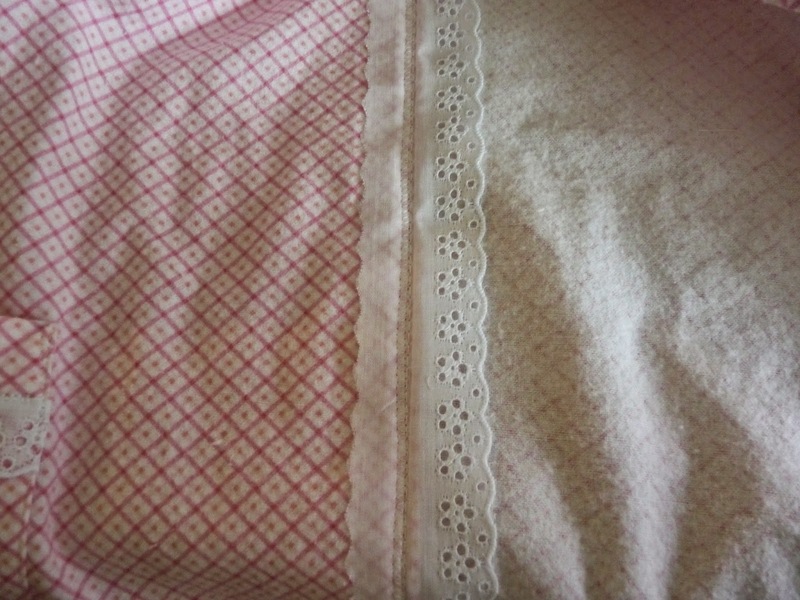 I chose a nice pink flannel and eyelet edging, both from Joann's, and cut Version A in size 8. As I usually do, I added a deep curve to the back facing. That white tape is paper tape from the medical supply section of the drugstore. It's much nicer to use than cellophane tape, as it doesn't shrivel when ironed and can be written upon. I always iron my paper patterns before laying out. 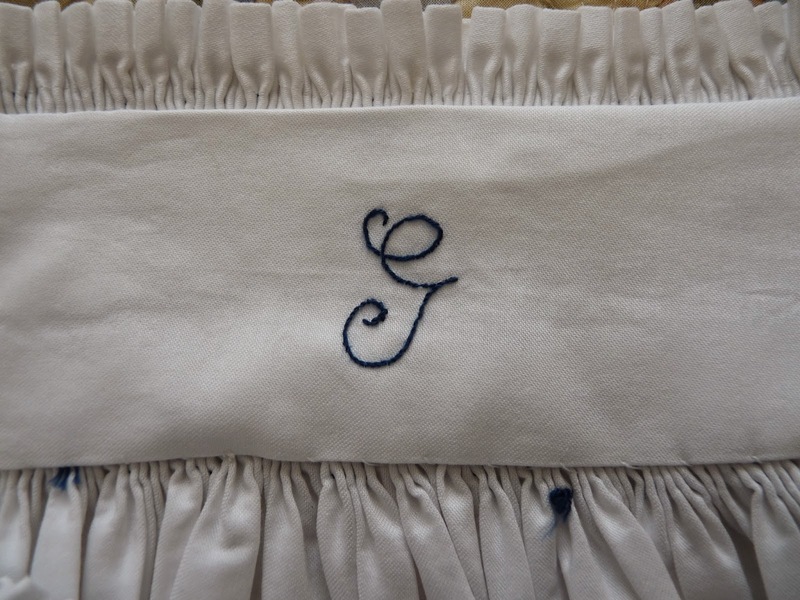 Then I embroidered her initials on the facing. Although the flannel seems to be a fairly nice quality, the edgings, as usual, are not, as you can see by the somewhat rough appearance. The pattern called for flexible edging, but those available were pretty nasty synthetics, so I went with the cotton eyelet. Then I had to figure out how to apply it, especially around the curves. 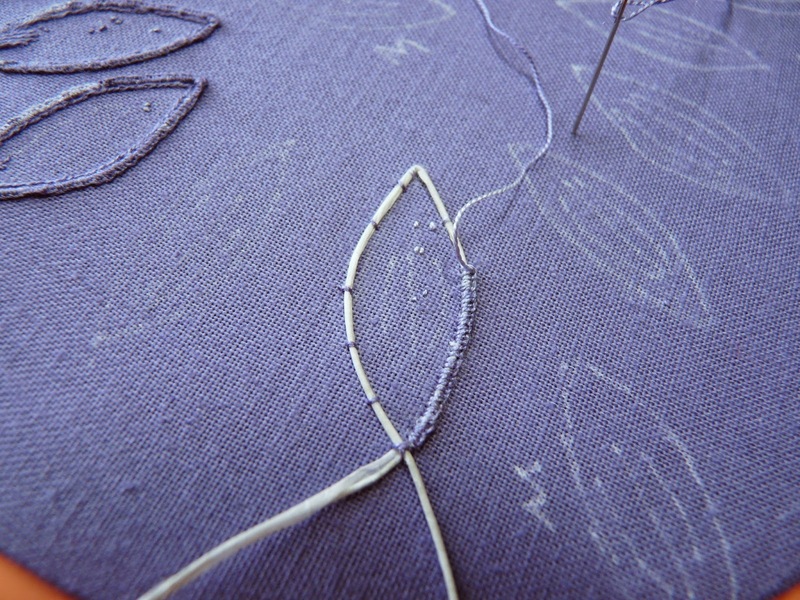 First, I folded and pressed the raw edge about 1/4 inch (0.6 cm) from the top of the embroidered part. Then I basted the edging along the fold line 1/8 inch (.3 cm) from the finished edge. To get around the curves, I basted the edging before attaching to the fabric and eased it as I sewed it around the curves. This is a shot of the edged folded back from the fabric finished edge. And trimmed it away close to the zig zag. Those duckbilled appliqué scissors sure do the job! After folding the edging back to the original position, I pin stitched the folded edge of the eyelet, to give it a bit of an heirloom look. On the top is a pocket, which I stitched with a size 100 jeans needle, but the sample on the bottom was stitched with a size 120 needle. I used the 120 needle for all of the eyelet applied to the entire edge of the robe, as you can see the holes quite a bit better. Next up, the completed robe. 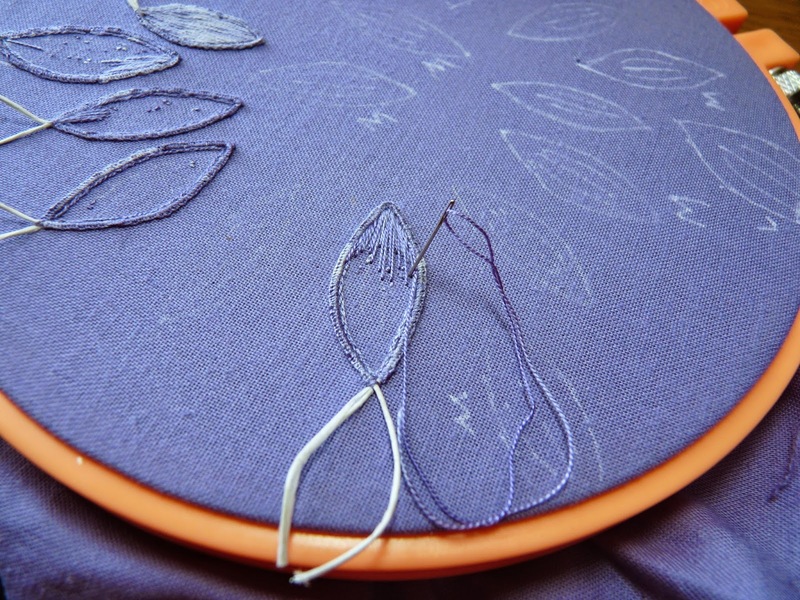 The last time I posted on the Rambling Clematis, I mentioned that each petal takes a few hours to stitch. So that got me to thinking, just how long does each one take? Starting with attaching the wire to the fabric I carefully timed myself while watching TV on the computer. 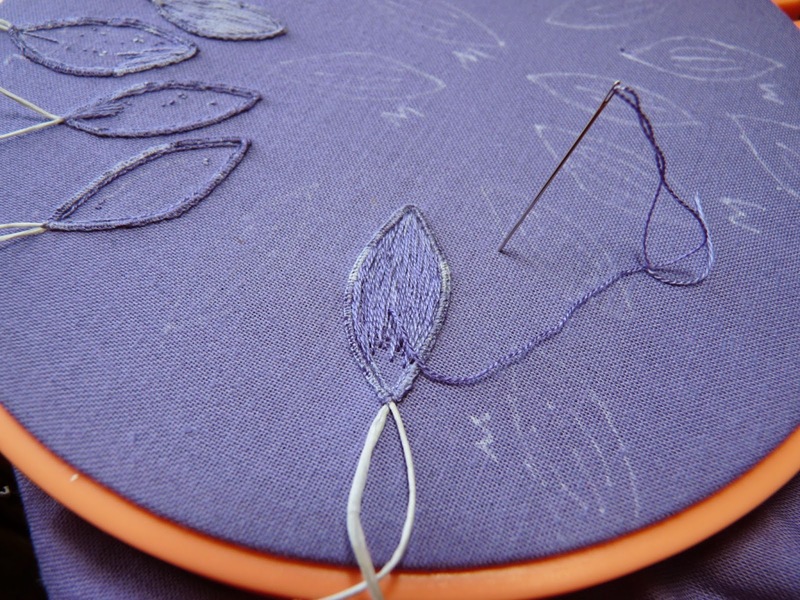 The buttonhole stitch working up the right side of the petal. And down the left back to the base. 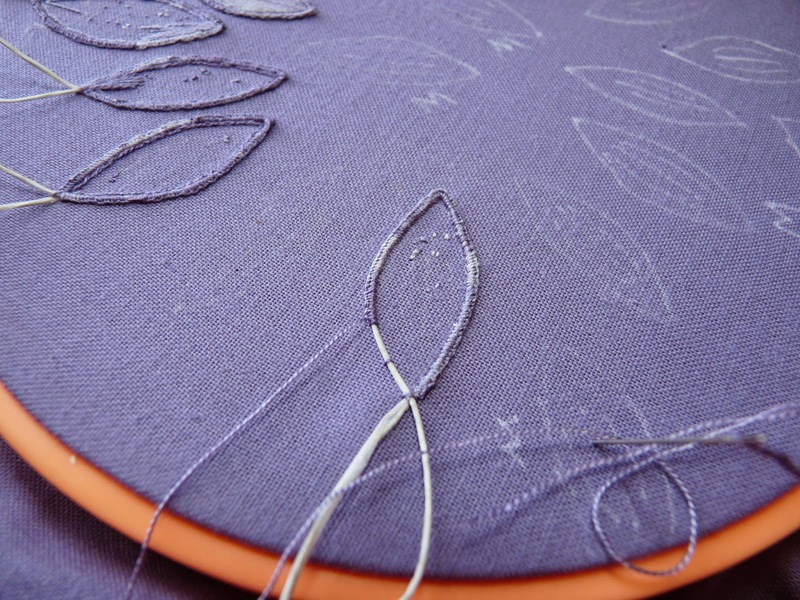 Starting to fill in the petal with long and short stitch. Almost completed with long and short stitch. The completed petal is the one in the center with darker floss lines and gold at the base. This was shot this morning so you can see how far I've progressed. Two petals complete, seven just missing the dark purple and gold, and four in work. The one petal I timed took 140 minutes, or 2 hours and 20 minutes! 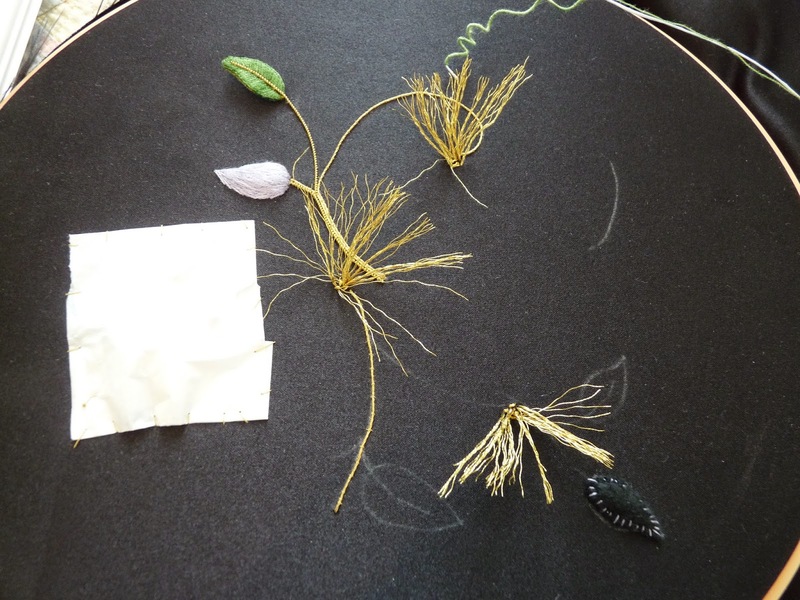 The project calls for 24 petals, not to mention several leaves and other bits. And this doesn't include cutting them out and attaching to the black silk ground fabric. This is going to take quite a long time. 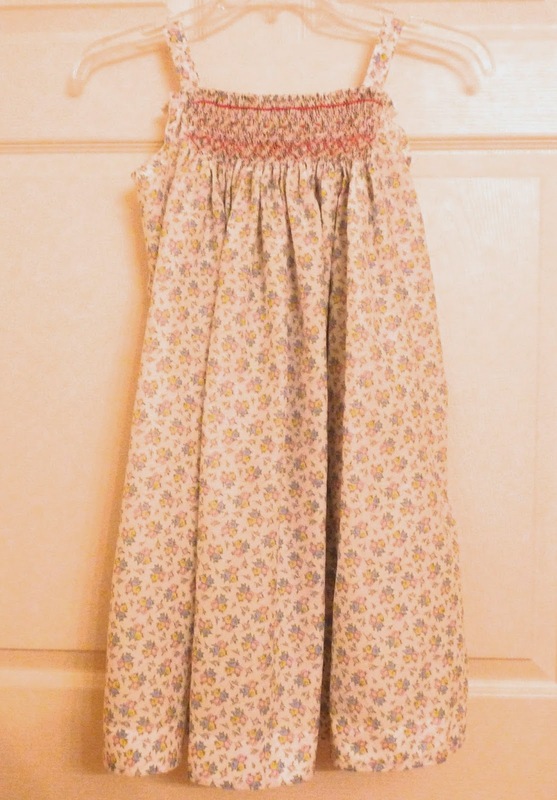 Bridget's nightgown is finished, and now she just has to wait until the nights are a bit warmer to wear it. Here in Colorado, it still gets to 30℉ to 40℉ (-1℃ to 4℃) at night. 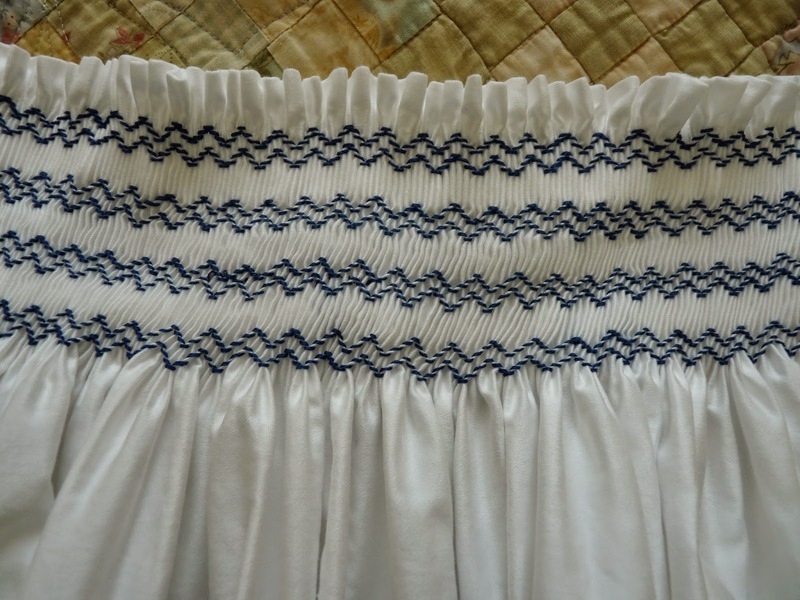 I made the smocking just a bit simpler than on the adult version, omitting two rows of trellis. But here they are on the back. The back facing with her initials so she'll easily know which is the back. 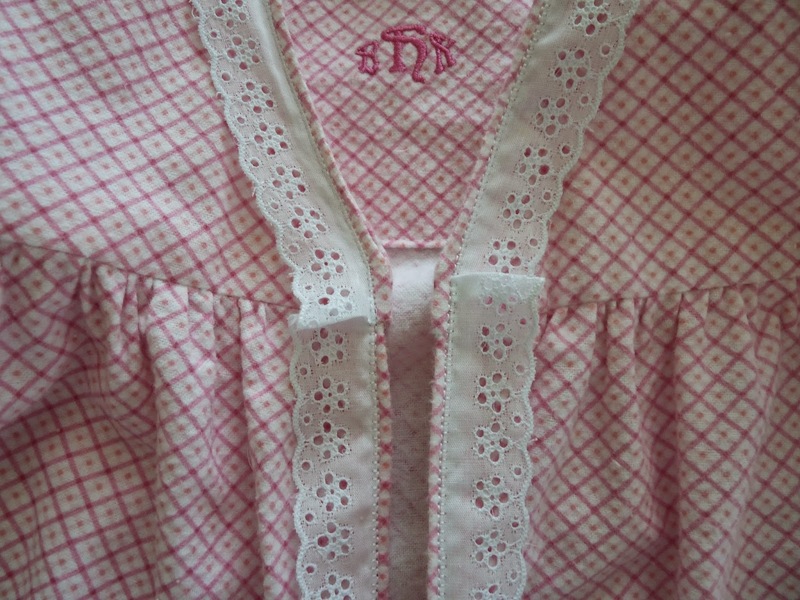 I made up these initials a couple of years ago for her first set of pjs. This was a challenge, as I am temporarily living in an apartment in Loveland, Colorado. I brought my sewing machine and embroidery unit with me, but virtually all of my threads (including embroidery threads) are in a storage unit in Southern California, along with all of my hoops, interfacings, and fabric. 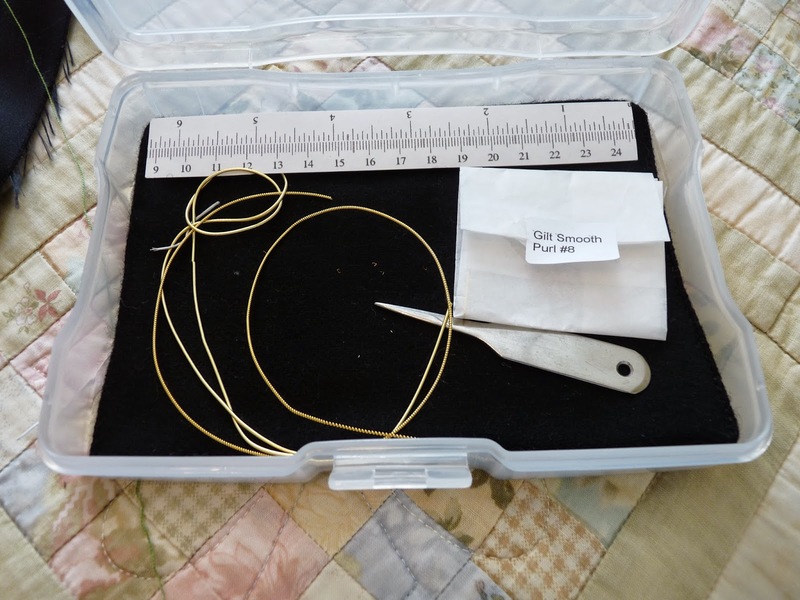 Luckily, I entered all of my hoops in my sewing machine software, and have a complete list of all of the embroidery threads I own. So I was able to purchase a hoop that I didn't have (but still don't really need), and match the pink rayon thread to the DMC 602, the darker pink I used for smocking. As the pink rayon thread is one that I don't own, I was able to purchase it knowing that it will make a good addition to my thread inventory. I made sure to add it to my list of threads to make sure I don't buy it again. 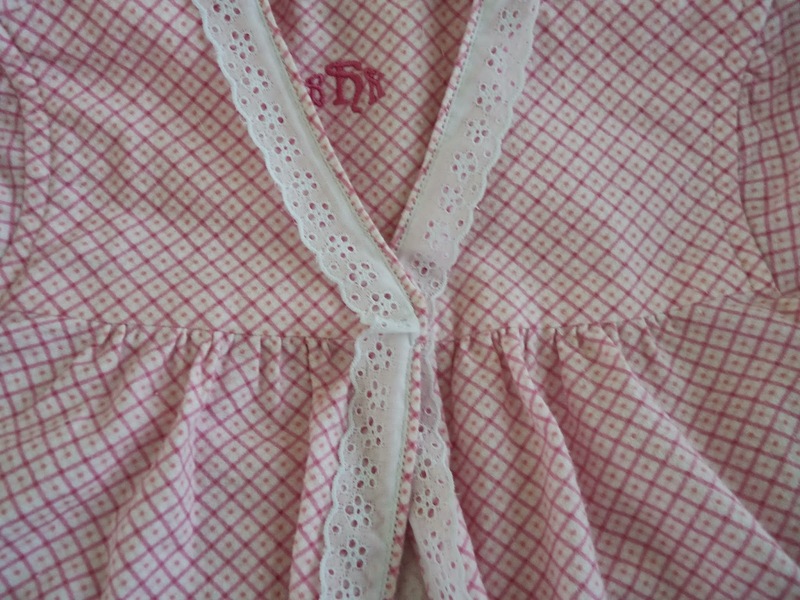 Now on to another nursing nightgown for mama. 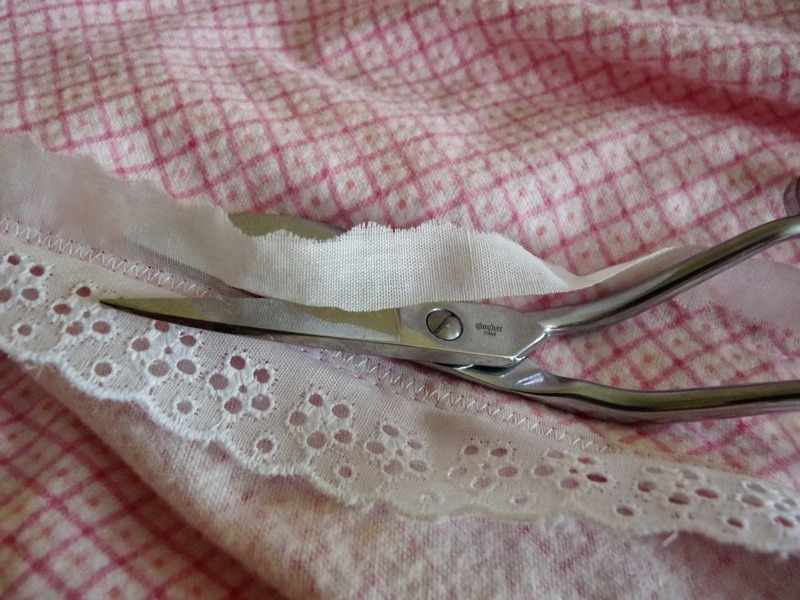 Warning: No sewing or needlework content in this post. Proceed with caution! One of my favorite podcasts, The British History Podcast by Jamie Jeffers, is in trouble. Amazon Payments, which is the method Jamie uses for his paying members, is going away in two months. Jamie needs to switch all of his members to PayPal, the sooner the better. This podcast has been going for about four years now, and covers British History in detail, just now getting to the Viking raids. Since most of us have no idea of all of the time between Boadicea and George III, this podcast is extremely informative. I pick George III because, as an American, he is the British Monarch most recognizable to me. Right now the podcast is discussing the reign of King Offa of Mercia around 795 AD. He is a contemporary of Charlemagne, to put him in a timeline that you might recognize. So if you love British History as I do, please listen, and if you really love it, consider becoming a member. Click here to find out all about it. Personally, I am glad to see Amazon Payments go away, as I feel it is unreliable, and Amazon just will not resolve issues with method of payments. I've been trying to get a credit card changed on their subscription page for over a year with no success. This is how far I've progressed. Mind you, I haven't touched it since November, what with packing and the holidays. But luckily, this is the one embroidery project I brought with me to Colorado. The big tufted parts are the turkey work centers of the clematis flowers, just not yet trimmed. The big white spot on the left is paper couched over a dragonfly to protect it. 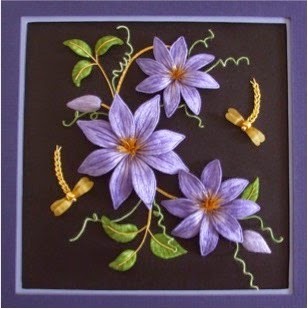 Every single clematis petal is worked separately, for a total of 24 petals, eight each of small, medium and large. I have all of the smalls marked, six of the medium, and none of the large. 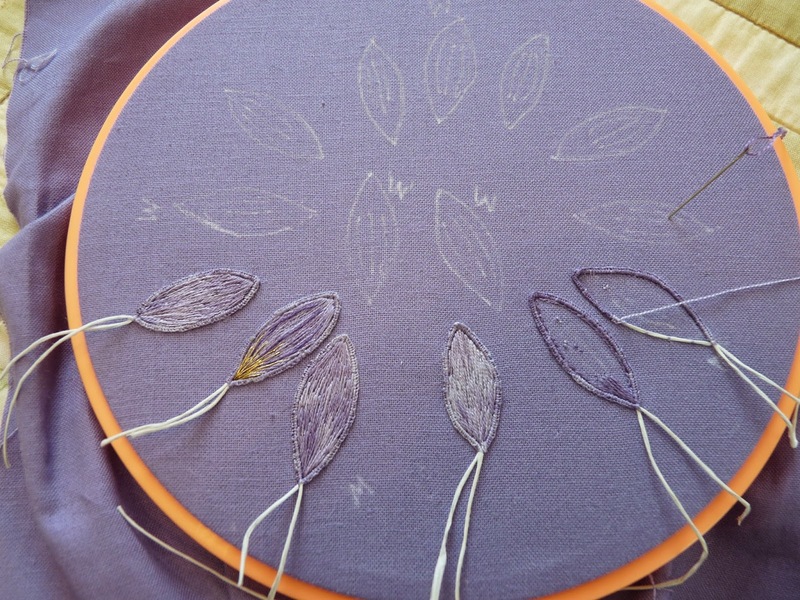 It takes a few hours for each petal, so there is quite a lot of work ahead! The threads are Gumnuts hand dyed silks, which have a "built in" shading to them. They are lovely to work with, as are most silk threads. Notice the variation in the colors, that is not silk shading, but the variation in the thread itself. The one completed petal with a it of gold, has a few threads of the darker purple, but really very little. This is my little gold work box. It's a photo box from Staples (large office supply store in the US), with a ruler downloaded from the internet and a black felt insert. 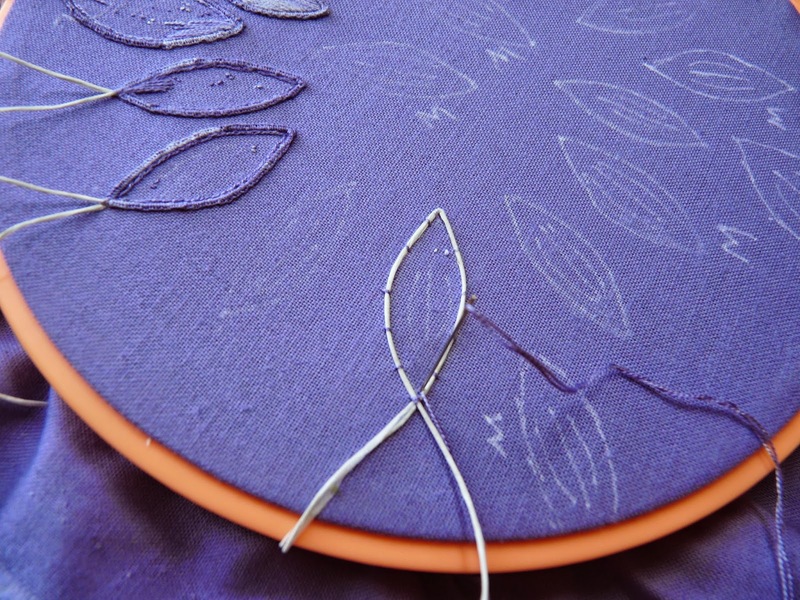 As you can see, this is a pretty good sized project, which will keep me busy with embroidery for some time to come. Earlier this week Mary Corbet of Needle 'n Thread posted a video of Ms Cole demonstrating some 17th century embroidery techniques, please watch it, it is fascinating. 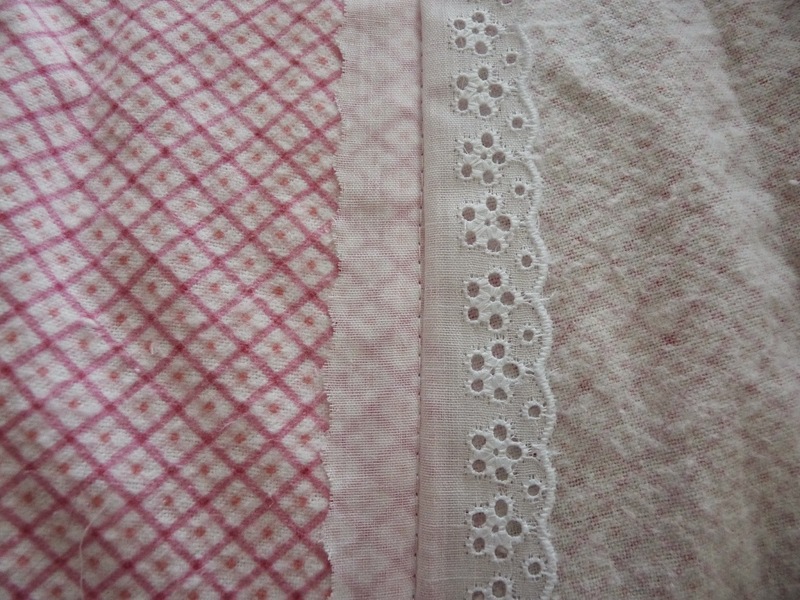 Last year our local SAGA guild in California had a smocked nightgown project over several months' worth of meetings. 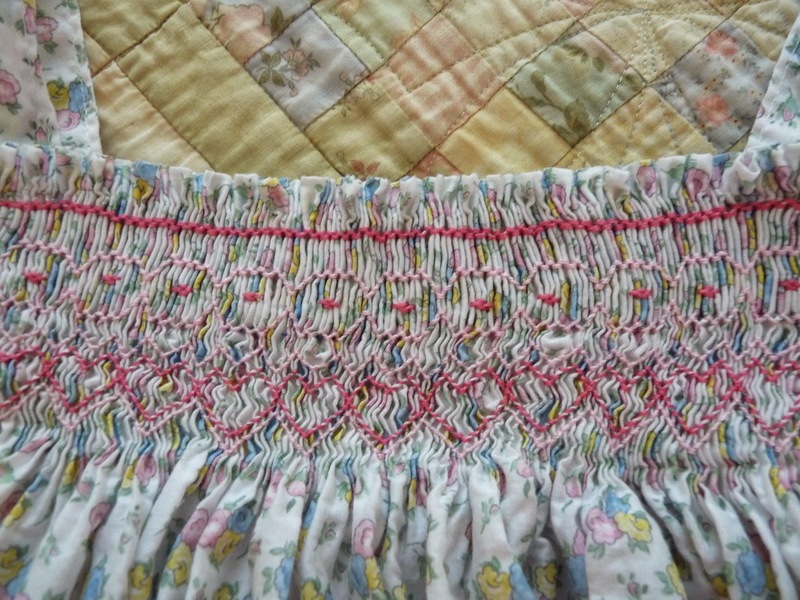 The pattern is by Kathy Awender, a national smocking teacher who is in our local guild. I just now finished it, which is good as the weather is getting warmer. I used a sheet for the fabric, bought from the clearance shelf at Bed Bath and Beyond. Sheets, especially good quality ones, make great nightgowns. The fabric is a bit more substantial than that of most woven summer nightgowns I've seen, and is very comfortable. 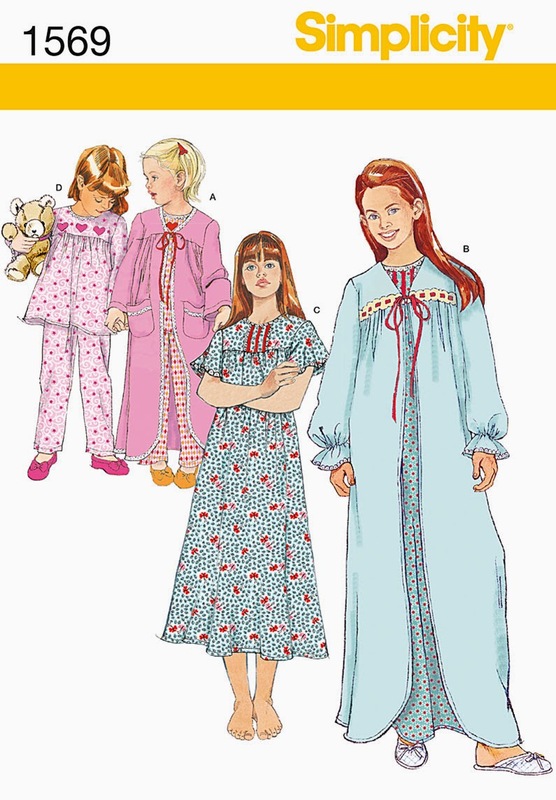 I love all cotton nightgowns, which ladies of a certain age will appreciate when dealing with our own personal summers. I used a dark blue DMC floss, #311, so it coordinate with my Blue Gingham Robe I made last year. 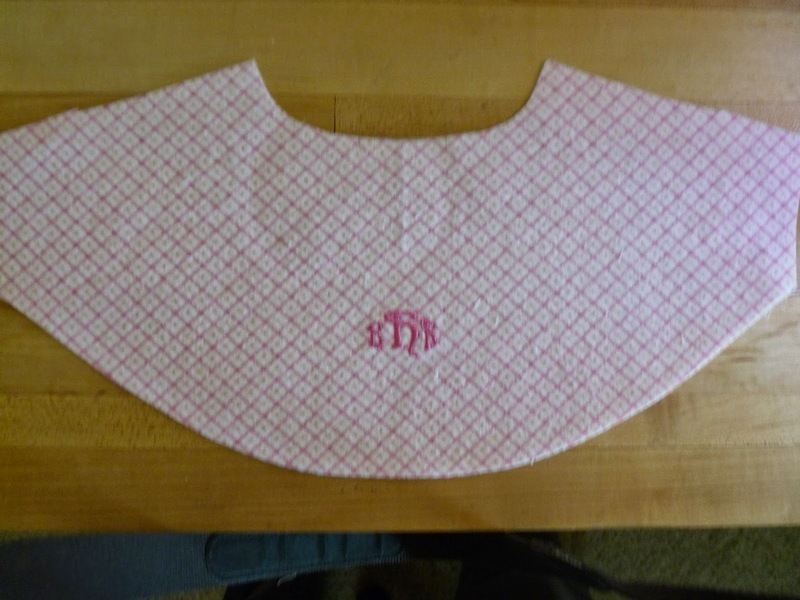 This is the front of the nightgown, a fairly simple pattern. And here is the back, even simpler. I personalized it a bit by stitching a G on the back facing. Since I wanted it to be sturdy, I machine stitched the hem. You can only see the stitches up close, and no one but Mr CS and I will see it. 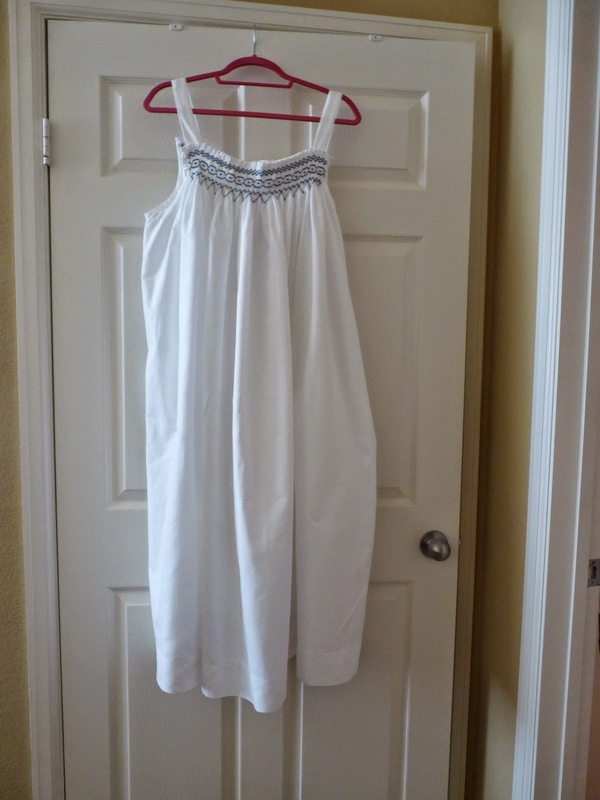 The picture at the top of this post is the nightgown in its ironed state for the photos. But in all reality, who irons nightgowns? So here is the photo in its natural state, right from the washer and hung to dry. I want to point out a slight problem with this nightgown. 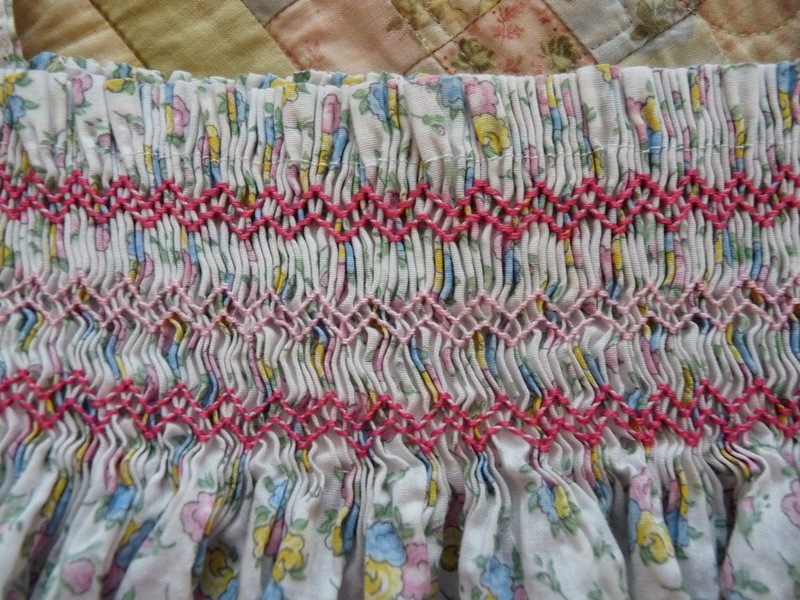 Since it is long, very wide due to the smocking, and made of a somewhat substantial sheet, it is pretty heavy. 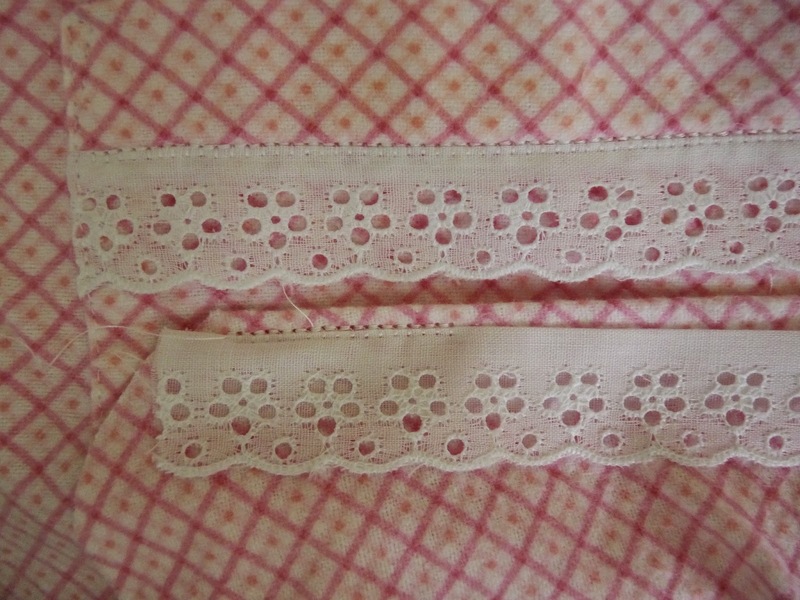 The straps are sewn by machine to the facing, which is then sewn by hand to the back of the smocking, front and back. This makes me worry that it will come apart at some point. 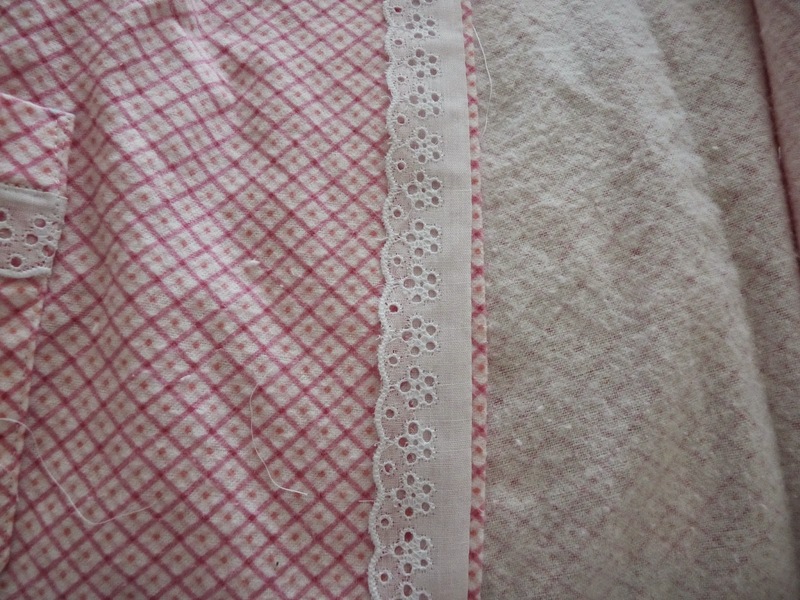 So I sewed the straps from the front, using a smocking stitch on my machine. 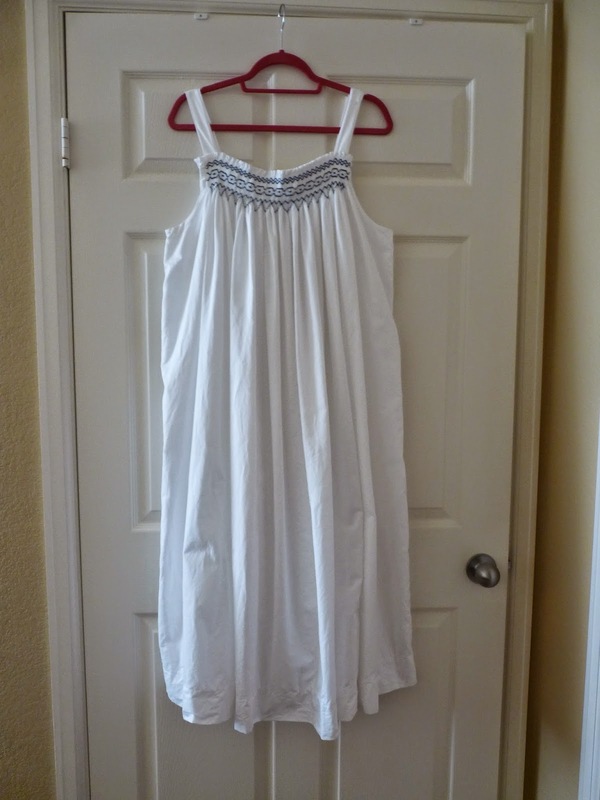 Since it is white, it barely shows and is much sturdier for it. 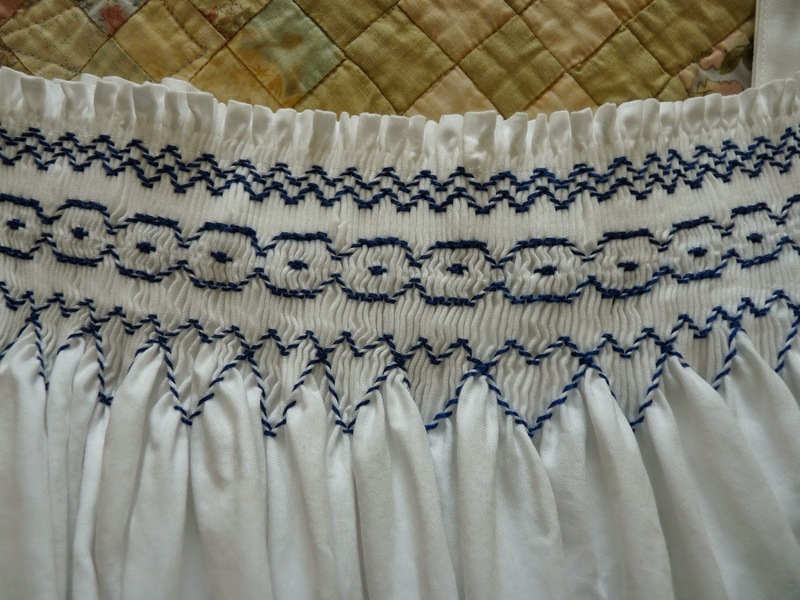 This post is Smocked Nightgown I, as there will be a II. It will be for my granddaughter, who is hounding me to finish it. It will be much prettier, as it is a flowered lawn from the LA Fabric District. So I'm off to do some serious smocking. Now I shall attempt to make up for some of the time I've been away with a post or two on what I've been sewing/embroidering. 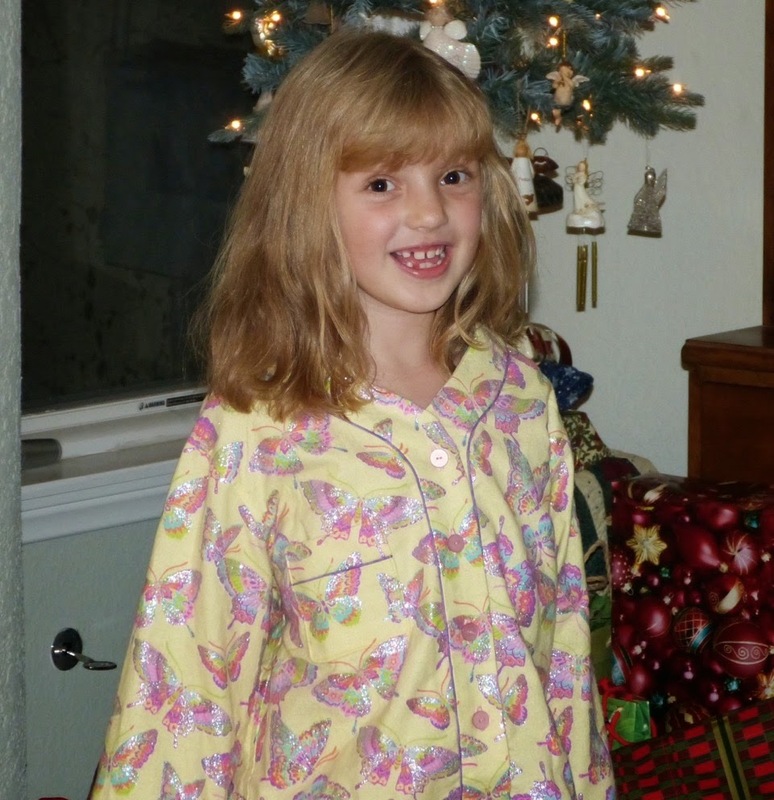 First of all, my granddaughter loved her PJs from Christmas 2014, which you can see if you follow this link. So for this past Christmas I promised her another pair, but made out of this yellow butterfly print. But since she doesn't care for yellow all that much I told her that the butterflies were purple and pink. Add the glitter, and we have a winner! Notice the puny little tree? We packed up the big one in the storage unit, so I bought a hall tree, set it on a small table, and put the tree quilt around it. No one complained. I put a little label on the bottoms so she could tell which part goes to the back. 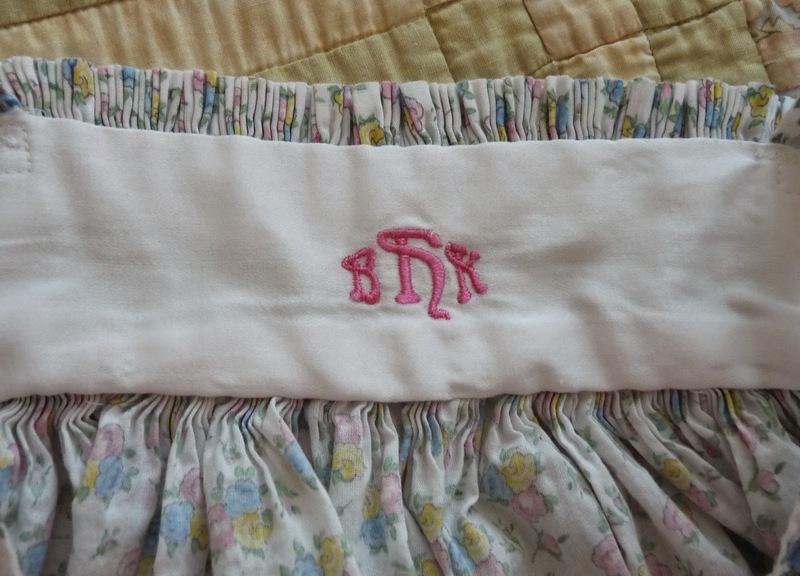 I machine embroidered her initials on the back facing, which I made extra deep like you see in nice women's nightgowns. I also did a reasonable job matching the pocket to the top, and a not so good job with the sleeve band. I didn't even try with the front bands as I ran out of fabric. I'll try again with the 2015 PJs, as it is such good practice. The pattern is Simplicity 2771, recommended by Bunny of La Sewista! 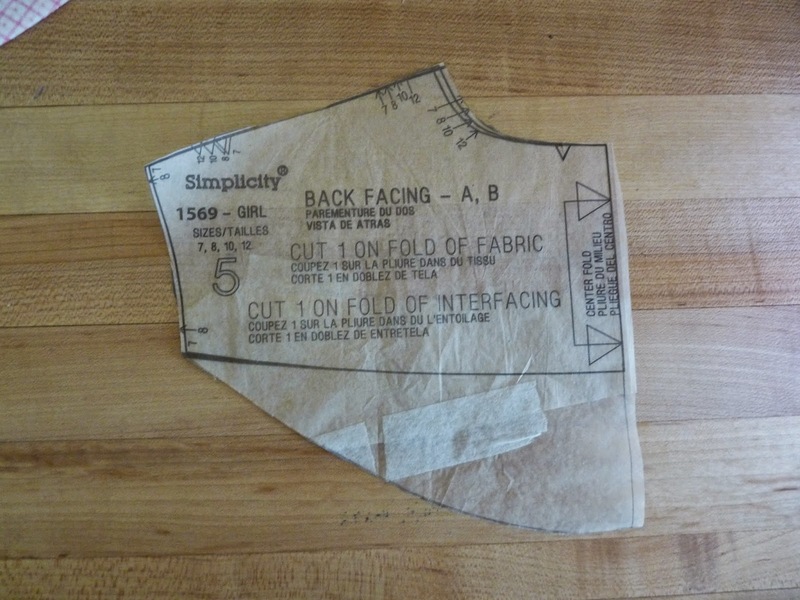 It is a great pattern with no collars to get rumpled. As Bunny says, who will iron PJs? Not my daughter, that's for sure. I might, though, as I do iron dish towels and sheets.